One of my goals as Captain is to encourage our members to play more. 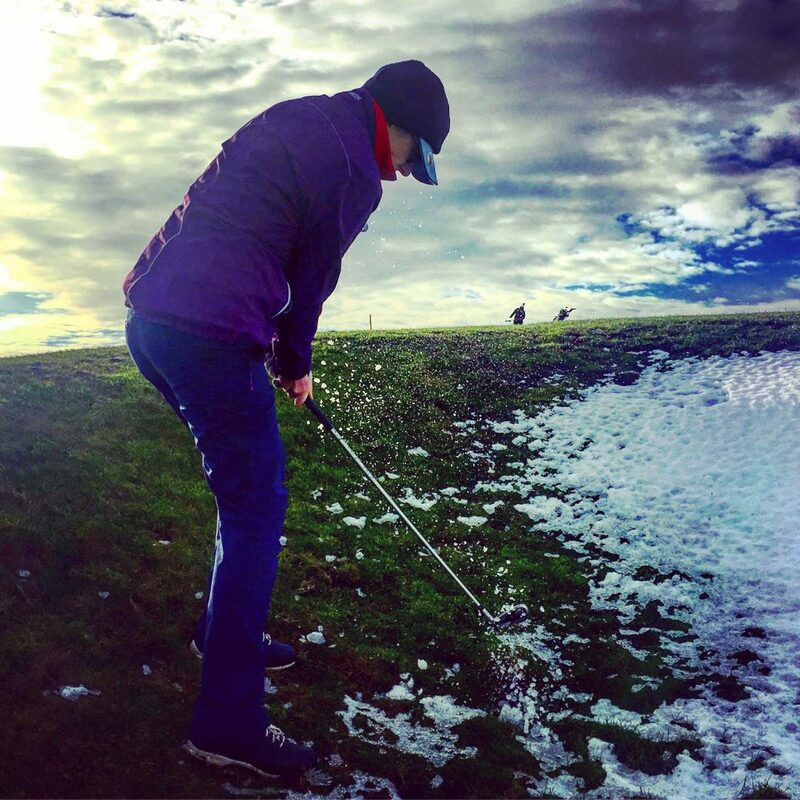 Of course, for most people, winter is a time when a round of golf slips down the list of priorities at the weekend. Who would want to go out on a windy, freezing hill wearing so many layers to avoid hypothermia that they can barely move their arms? A pub lunch and a snooze are so much more appealing. That’s why I had the idea of organising a 9 hole winter eclectic competition. What is an eclectic competition? The principle of an eclectic competition is brilliant: for every round you play, only the best score on each and every hole is kept. You end up with one eclectic card showing all your best scores for the rounds you played within the specified period. I made it so people could hand in 9 holes at a time to try and make it even more accessible. That way, Thundersnow-shy golfers as well as our older members who rarely play 18 holes could participate. I mentioned it to a few people at the club and they told me they used to have one. They had a whiteboard where they would keep their scores, which they would wipe off and change when they improved. I wasn’t surprised to hear that it got quite messy. Surely, there had to be a better way. Enter Excel, the program I love to hate, because as a translator, it’s the worst possible format to work in. However, a workbook seemed to me to be the high-tech version of the whiteboard. Plus, golf geeks like me would have the untold pleasure of finishing with a clear idea of where their strength and weaknesses lie in terms of the various holes on the course. I used to think the 11th was one of the easiest holes for me, but records reveal that I make par far less often than I thought. Never, in fact. I thought I was useless at par 3s (3rd, 6th and 8th); in fact, I’m not that bad. Anyway, enough about me. The benefits were many: giving members, old and young, a reason to go out and play golf, stats for the geeks and an extra competition that was longer and very different from the rest. All I needed for a ready-made eclectic workbook, because I don’t have the skills to build one myself. It was surprisingly hard to find one that suited my needs, but the Internet provided. It is called Excel Golf Scores Workbook and is provided by Contextures. It was an excellent starting point, but not exactly what I wanted, as it’s for a single user. I needed one worksheet per player feeding into a general results’ table for the competition. Thankfully we have many talented people in our section, so I asked one clever member to help me out (thank you Susannah). She built the bones of the file I needed, and I fleshed it out. Each player’s result worksheet feeds into a table that gives the nett and gross scores as well as the number of 9 hole cards put in. Et voilà! All you need to do is click the little arrow in the Nett column to end with a table for your competition. The result? I’m not certain it did encourage people to go out in the awful weather we had this winter. However, people must have enjoyed it, as they were keen to have a Summer eclectic competition and many more have signed up for it. So I guess the eclectic competition is here to stay at Brighton and Hove! Download my Amazing eclectic competition workbook. Start by entering the par for each hole in your golf course on the player’s sheet. The method will vary according to your version of Excel, so there’s no point in me explaining how. I can help with Excel for Mac, but that’s about it! After each round, enter the date and your score for each hole. The pars will be coloured orange, and scores below par are bright green (see example above). The player’s summary at the top gives the best and average scores and the number of rounds played. There’s also a tally of your pars, bogeys, birdies, etc., for each hole. The most frequent type of score is highlighted for each hole. Enter the names of the players In the A column. The B column needs to be populated with their gross score, so enter =REF!V10 in the formula bar, replacing “REF” with the name of the player’s worksheet (in this example, “LauraD“). Enter the player’s handicap in the C column manually (I couldn’t work out how to make it automatic, as handicaps change). Column D is populated automatically. Column E is for a competition where players are allowed to enter 9 hole cards. If you want to base your competition on 18 hole rounds, in every player’s sheet, click on cell C4 and delete “+L49” in the formula bar. I’m very happy to help if any of this is unclear. Just fire me an email. I did a similar spreadsheet for our Eclectic when I was Captain last year. 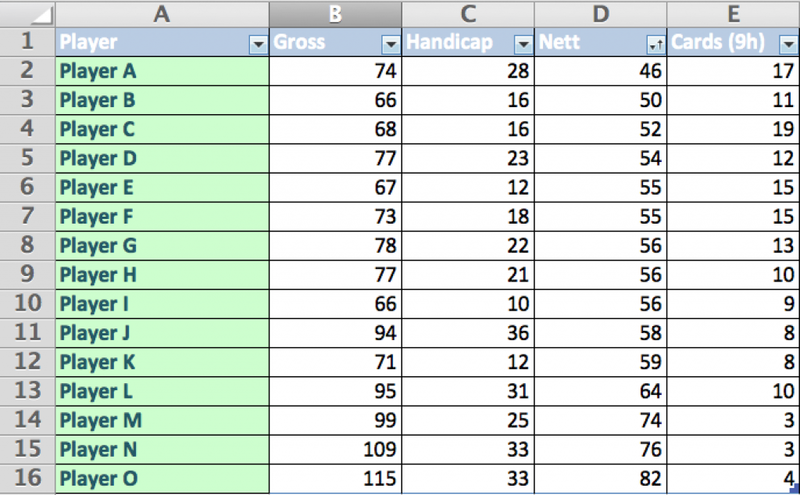 Rather than set up a worksheet per player, I have a system of 1 worksheet per round, 1 work sheet holding the handicaps of each player, a worksheet that calculates the minimum score on each hole for each player (this is an Excel pivot table) and an overall result sheet that grabs the pivot table results, handicaps and interprets the stroke index. Works well, but needs some Excel knowledge to operate. 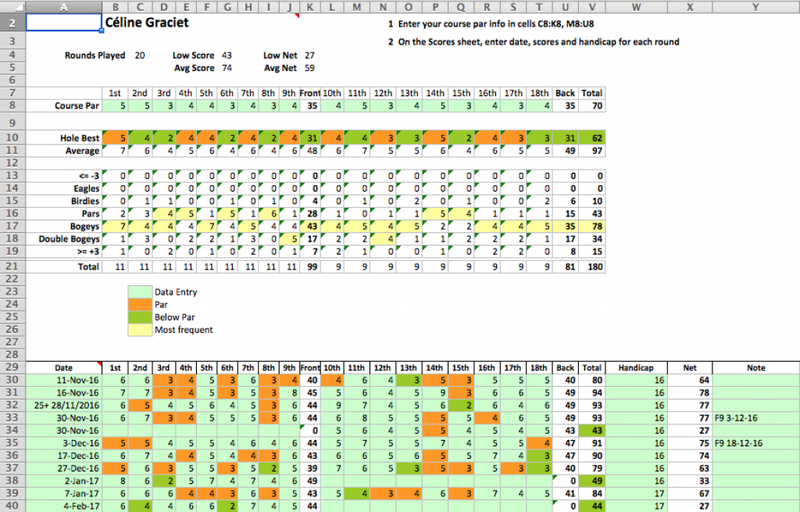 Each round data, is exported from Handicap Master (Player + scores on each hole separated by commas). Our club has never managed to use handicap master for Eclectics. I am willing to share. That sounds like a great system, Alan. I’d love to see the worksheet. Willing to share if any developed system is issued free. You have my email address, so please contact me there and I will forward the workbook. Works well importing .csv file with player, score1,score2 etc. format. What file format does your handicap system use to export competition scores ?